Geneva, Switzerland, 3 March 2016 - MSC Cruises, the Swiss-based world’s largest privately-owned cruise company and market leader in Europe, South America and South Africa, is meeting strong, growing demand for wellness travel by introducing an exclusive Wellness Experience, developed in partnership with Technogym, the world’s leading wellness company. In another MSC Cruises industry-first, the new offering brings together the Company’s ability to create unique cruise experiences with Technogym’s end-to-end wellness expertise to devise a bespoke experience that enables guests to combine discovery and culture with their personal wellness goals to reinvigorate the body and soul, now through an experience exclusively available whilst onboard an MSC Cruises ship. Nerio Alessandri, Technogym President and Founder, commented: “For over 20 years we have been promoting the concept of wellness as a lifestyle made of regular physical exercise, a healthy diet and a positive mental attitude. Today wellness represents a global consumer trend that can impact on people’s life and health. This is why we are proud to partner with MSC Cruises to develop and deliver a unique and completely new wellness experience." To design the new experience, the MSC Cruises team worked for over one year with the wellness, fitness, nutrition and technology experts at Technogym. This resulted in the co-creation of an exclusive personalised programme with a wide range of dedicated activities, facilities and special privileges. The experience features cutting-edge technology and state-of-art fitness facilities, a co-created food and beverage offering available throughout the day, exclusive shore activities as well as access whilst onboard to MSC Cruises Master Trainers certified by Technogym. Understanding guests’ wellness motivations, such as the desire to look and feel better, improve sporting performance or health and happiness is key to creating a motivational wellness programme. For this reason, the experience begins well before the holiday, as once the cruise is booked they are invited to complete the Aspiration Finder™, the first-ever scientific online questionnaire developed by Technogym’s Research Department. The result of the questionnaire is a personalized Aspiration Map, which forms the basis for the personalised programme. Once onboard, guests will receive a one-to-one appointment with the Master Trainer who will conduct an assessment consisting of a body scale analyser test combined with an in-depth consultation. This will result in establishing the wellness objectives each guest wants to work toward and develop a programme customized to each guest for the duration of the cruise. In addition to this, guests will receive a health check-up carried out by the MSC Doctor. An MSC Cruise ship provides an awe-inspiring backdrop to motivate guests to get active and meet their wellness objectives. With breathtaking sea views, elegantly designed public places and modern facilities, guests have at their disposal an array of indoor and outdoor areas where they can follow their personalized wellness programme, including swimming pools, a scenic gym, open−air sports facilities as well as being able to train on the top deck exclusive solarium, a sanctuary of serenity. Further to this, participants to the Wellness Experience will receive complimentary internet access to enable the use of an MSC Cruises-only version of Technogym’s award-winning mywellness app. This cutting-edge platform will support their training programme onboard and they can continue to use this once they return home. The mywellness app tracks the movement of the users and assigns them a daily movement target, it includes all the information on the MSC Cruises personalised training programmes and also integrates indoor training performed using gym equipment with daily life activities and outdoor training, directly through GPS and smartphone accelerometer functions. In addition, whilst onboard, guests will be able to access timetables to fitness classes and track their appointments. MSC Cruises Wellness Experience guests will also benefit from exciting new group fitness classes that are being developed with the fitness experts at Technogym, designed around Technogym’s ARKE equipment for core and bodyweight training as well as Technogym Group Cycle class. In addition, a range of new on-trend fitness classes such as Bella Barre will be introduced along with popular favourites including Tai Chi, Pilates, Yoga and Timetables for the group classes will be coded to help guests select the right classes for their Aspiration Profile. 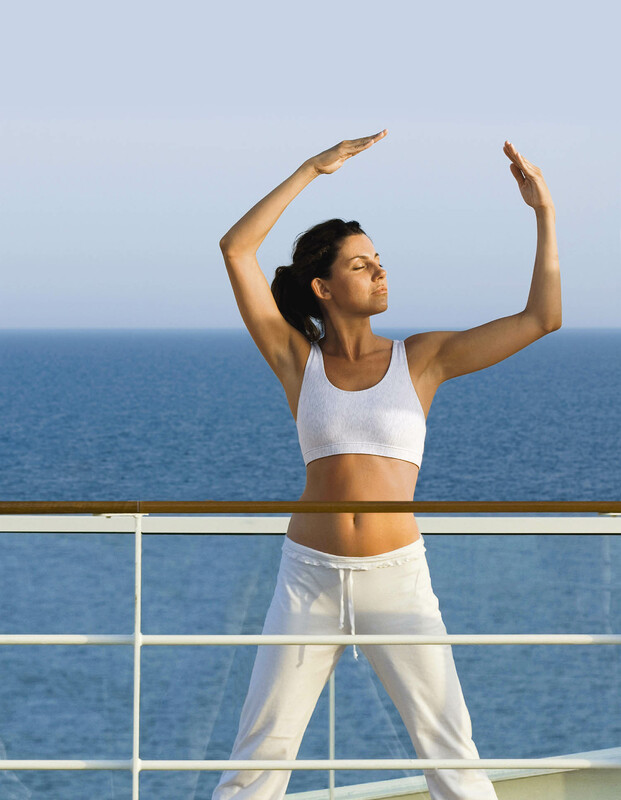 Shore activities exclusively for the Wellness Experience participants have been specially designed to complement the onboard fitness programme so that guests can discover the sights at the ship’s ports of call whilst keeping active. The activities also provide the opportunity to socialise and meet like-minded people with similar wellness goals. Highlights include jogging around Ancient Olympia, a bike tour of Copenhagen, hiking up Mount Floiena in Norway, a fun triathlon in Cozumel comprising of kayaking, running and snorkeling or beach training in Rio de Janeiro. The Wellness Experience also places a strong emphasis on nutrition. A wide range of delicious and balanced wellness menu options have been developed in partnership with the Technogym’s team of nutrition experts. The buffet will feature a dedicated wellness corner with a choice of dishes available at breakfast, lunch and dinner, designed to match the needs of the different Aspiration Profiles. The main restaurant will also feature healthy options that will be clearly distinguished on the menu to make it simple to select the right choice and there will be a wellness room service breakfast menu. The MSC Aurea Spa bar will also serve a new range of protein and energy drinks as well as an array of other wellness beverages. Finally, another feature of the Wellness Experience is a choice of cabins on the upper decks and in the most desirable areas of the ship. An MSC cruise is distinguished by the meticulous attention to detail and this experience is no exception. Guests will be provided with a wellness mat and a Technogym Wellness Bag™, sports clothing and towel, cabins will feature a wellness themed mini-bar with sports drinks and a Fitness TV channel with videos created by the experts at Technogym. Even the laundry of the sports kit is included to ensure that everything is stress-free. The Wellness Experience is now open for booking for cruises starting in April 2017. Technogym is the world leading company in the wellness and fitness fields. It is also the Official Supplier of six most recent editions of the Olympic Games as well as to some of the most celebrated sports teams in the world. Further, as the world’s leading supplier of technology and design-driven products and services in its sector Technogym provides a complete range of cardio, strength and functional equipment alongside a digital, cloud-based platform for consumers to connect with their personal wellness experience anywhere, both on the equipment and via mobile when outdoors. More than 35 million users train every day on Technogym. Not available on ships embarking from South Africa and China. The Wellness Experience is only available for adults.